Hopefully by now everyone knows that mercury is harmful to us and our environment, especially when it makes its way into our waterways. In an effort to reduce the amount of mercury that gets introduced into our beautiful Lake of the Ozarks, we have partnered with the Thermostat Recycling Corporation to collect and recycle thermostats that contain mercury. 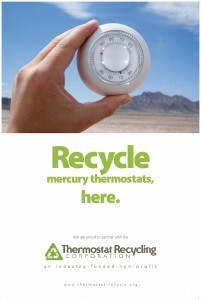 The Thermostat Recycling Corporation (TRC) is a non-profit corporation that is industry funded and supported by 31 manufacturers that produced mercury containing thermostats. Since it’s inception in 1998, the TRC has collected more than 1.4 million thermostats from its more than 3,600 collection sites nationwide. We our proud to be one of those collection sites and we want to make it as easy as possible for anyone to recycle their old thermostat. Keep the thermostat intact. Do not remove the mercury bulb from the thermostat and keep all covers. Stop by our showroom at 4177 Osage Beach Parkway South and one of our representatives will take it from there. Or if you would prefer, you can even put it in the collection box yourself. So whether you replace your thermostat yourself or you have another company replace it, please do what’s best for our environment and recycle it. And of course if B&B Heating and Cooling replaces your thermostat you can be certain it will be recycled!